Delhi is a good place to be in October this year. Diwali, the Festival of Lights, falls on the last weekend of the month. It is holiday season, having started with Dussehra and Durga Puja in the first week, schools are closed and people are in the mood for celebrations. The date of Diwali changes each year as the day it is celebrated is calculated according to the position of the moon and the Hindu lunar calendar.This year, Diwali falls on Sunday October 30th. The Diwali Celebrations kick off with Dhanteras on 28th October. It is a celebration dedicated to wealth. Lakshmi Puja is performed in the evening and people traditionally buy gold and silver and also new kitchen utensils on this day. Homes are cleaned and readied to welcome the Goddess of Wealth, the Goddess Lakshmi, into their homes. 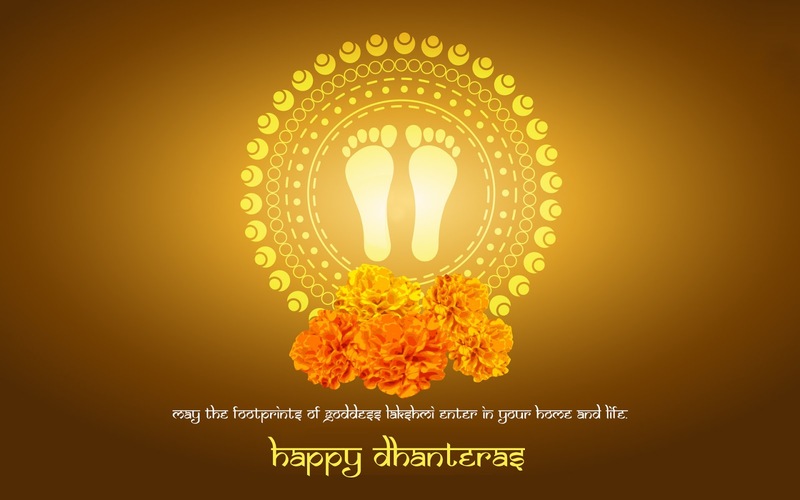 The entrance of the houses are decorated with flowers, diyas, rangolis and this year the Shubh Muhurat for Dhanteras Puja 2016 is 17:47 to 18:20 for duration of 33 minutes. The next day is Choti Diwali (Little Diwali). 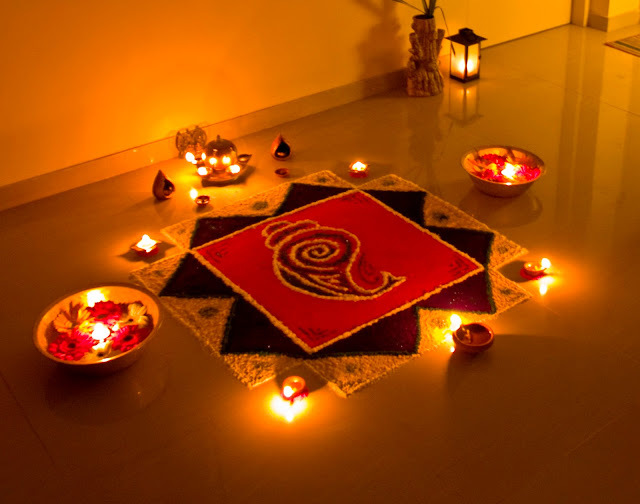 Rangoli is created in doorways and courtyards, diyas are lit and people start bursting crackers from this day itself. Diwali is celebrated all-over India.It is the ‘Festival of Lights’ and is celebrated joyously all-over the country. It is also the festival of wealth and prosperity. The legends behind the festival are many but common to all is the theme of Victory of Good over Evil. The most popular one is about the demon Narkasura who managed to acquire such awesome powers that he began to terrorize the three worlds. His defeat and death at the hands of Krishna is celebrated as Diwali. The third and main day is Diwali. Diyas and candles are lit and fireworks are burst everywhere, giving Diwali its name the ‘Festival of Lights’. Families gather together and perform the Lakshmi Puja in the evening and exchange gifts and sweets.The Lakshmi-Ganesh puja is the most important ritual of the Diwali festival. This puja is performed in homes, shops and offices to seek the blessings of Goddess Lakshmi and the God Ganesha for wealth, prosperity and happiness. Many people start the new business year at Diwali. Large firework displays are held which celebrate one of the legends of the ‘Ramayana’, the story of Rama and his wife Sita. The fireworks signify Rama’s return to his kingdom after being exiled for 14 years and defeating the evil demon King Ravana, who had kidnapped Sita. Diwali is a celebration and explosion of light…colour… food and noise! Leading up to Diwali there are fairs, food festivals, art exhibitions, cultural programmes, sightseeing tours happening in Delhi this October. Yesterday I explored Delhi via the HOHO Hop-on-Hop-off Bus Service. Today I am going to visit as many of these events as possible … it is a cultural bonanza I do not wish to miss! There is no better way to celebrate the festival than to be part of these wonderful gatherings that are full of light, happiness and fun. So, once again, carrying my camera and bottle of water I set off on my second day Tour of Delhi. At this time of the year, I would recommend to dress in light comfortable clothes. Morning Fiesta at the Hauz Khas Village, South Delhi. Starting early in the morning, this was my first stop while waiting for the Walk to begin. Strolled around the beautiful fort (entry is free) and wandered around the lake, a very pretty and popular site. 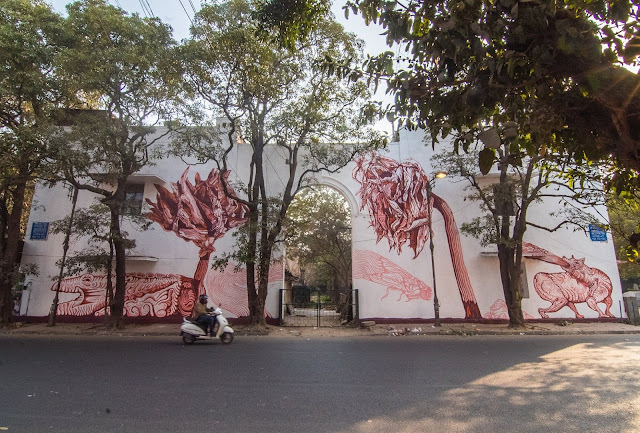 One can have a nice relaxing morning here, enjoy the ancient sight from Moghul times and wander through this area of hip and funky boutiques and lunch or dine at one of the fantastic restaurants. 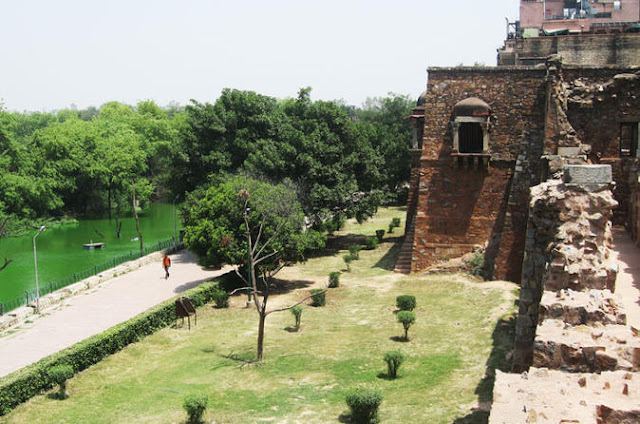 This heritage walk takes one through the history of the HauzKhas… how FerozshahTughlaq saved it from encroachment, why it was chosen to be the site of the largest Islamic seminary in the 14th century and learn about the final resting place of Sultan Feroz Shah Tughlaq and other interesting information. Location : HauzKhas Village, Block C 2, Ansari Nagar East, Sri Aurobindo Marg, Delhi, NCR 110016. There is the DilliHaat Diwali Mela. There are plenty of options here, from apparel and imitation jewellery to curios for the home. A wide variety of diyas, lanterns, handicrafts and decorative items make for great Diwali gifts. I will spend some time here as I will need to explore all the stalls! The Diwali Mela held by the Blind Relief Association is also now in full swing. 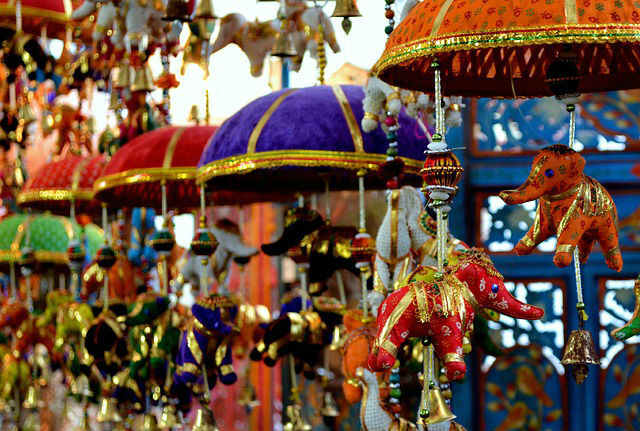 This year, along with the pretty diyas and artsy fengshui items, there are handicrafts from Kutch, paper products and lots of unique home decor items on sale. The Diwali mela is also a hit for its food stalls that offer pan-Indian cuisines. The Archeological Survey of India has been dedicating a lot of effort in resurrecting this monument to its former glory. As a part of the revival process, there is a three day festival called the Qutub Festival that is being held in Delhi in October. 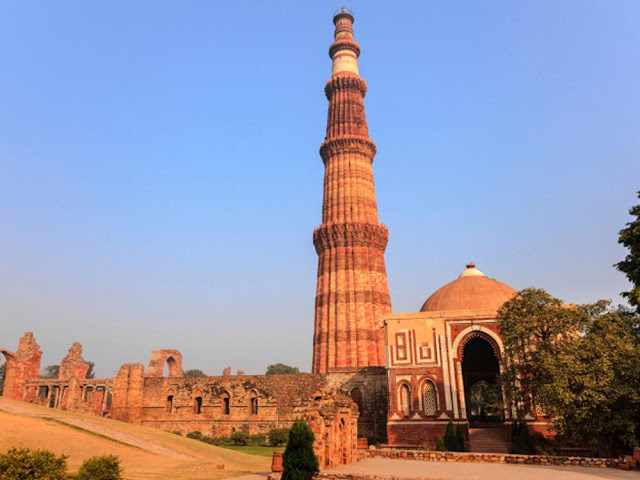 The Qutub Festival is held on the premises of the Qutab Minar complex. It is organized by Delhi Tourism. Artists and performers from different parts of the country gather to perform on the occasion. Qutub Minar is a festival to celebrate the splendor and magnificence of the Minar and showcase its past glory and majesty to the world. One of the main focuses of the Qutub Festival is the attention it gets, both national and international. The cultural events and shows are held against the historical backdrop of the QutubMinar. There areperformances by folk musicians and classical musicians as a part of the celebrations. The three days of nonstop music and dance brings back to life this illuminated ancient structure. The Qutub Festival is organized jointly by the Delhi Tourism and Transport Development Corporation and the Sahitya Kala Parishad. There are also a number of regional food stalls that are set up at the premises serving the local cuisines of Delhi, Madhya Pradesh, Maharashtra and the north eastern states. This is a contemporary art fair being held at Palika Park, Connaught Place from22nd to 25th October 2016. 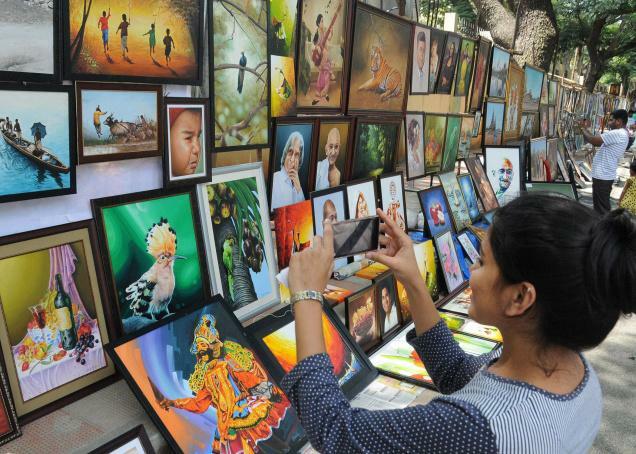 Event Description : New Delhi Municipal Council in support with Studio 55 Art Gallery presents ‘Diwali Artmart’ a contemporary art fair. The Lodhi Gardens is close to Connaught Place. On this Walk you will discover the city of Domes (Gumbad) and the emancipitation of the daughters of the Lodh’s who mastered both Sanskrit and Persian and made arrangements for the education of their slaves.Learn how the Lodhis purchased the starving city, why they exalted meritorious people even if they were prisoners and cracked down upon blind faith and official corruption. Explore the Supreme Court established by the Lodhis where all were assured of fair justice. How musician had to competeto sing in the royal court of theLodhis. The monuments covered in the Walk are the Tomb of SikandarLodhi, Sheesh Gumbad, Tomb of Mohammad Shah, Bara Gumbad and Mosque. A camera is a must! Carry water and dress light. 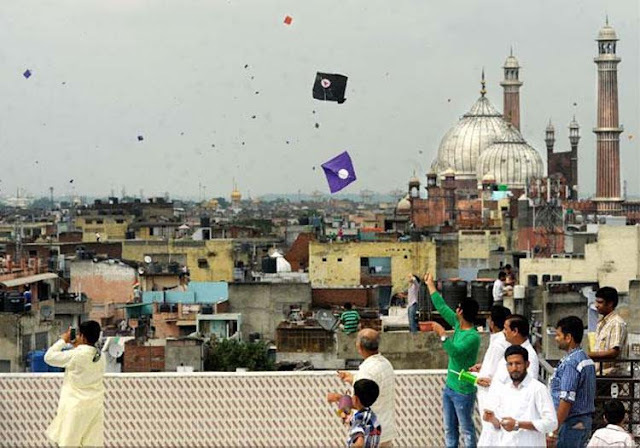 Fly kites at the rooftop of Haveli Dharampura along with Hi-tea. 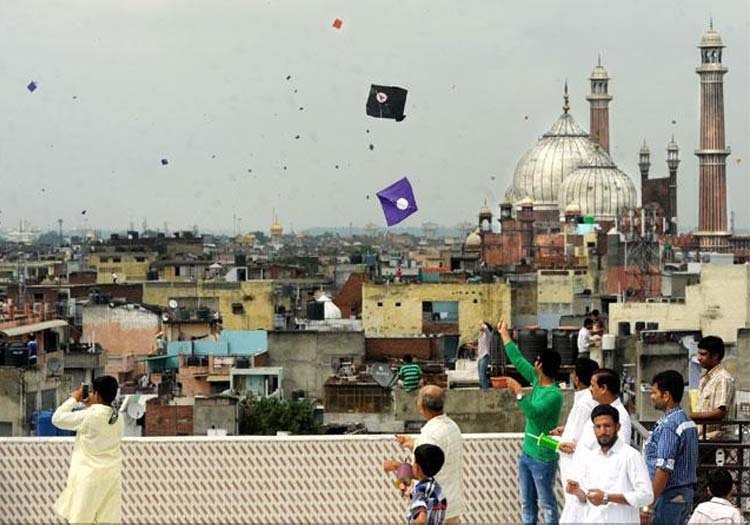 It is breathtakingly beautiful to look at the sky covered with colorful kites from the Haveli rooftop, especially when a cool breeze takes them higher. The PhoolWalonkiSair is a traditional fair, literally a festival of flower-sellers, which is held in Mehrauli in South Delhi, every year from September to October. During the festival, floral tributes are offered at the dargah of the Saint and the Yogmaya temple. There are performances by Kathak dancers, qawalis, kite –flying and wrestling. Fire dancers lead a large procession across the streets carrying flower pankhas made of palm leaves decorated with flowers. The walk shares stories behind the festival. The walk is through the landmarks of Mehrauli village … one of which is an empty grave meant for the last Mughal Emperor! Meeting Point: McDonalds, Chandni Chowk. The heritage walk of Old Delhi and Chandni Chowk is to make travellers experience the cultural heart of Delhi, Chandni Chowk. a distinct cultural location every 10 meters. One goes through the largest wholesale market in India, passes religious sites, historical monuments and food joints that ace delicacies like DahiBhalla, AaloTikki, KuhladdLassi, Jalebi, Paranthas and sumptuous Mughlai food. The Chandni Chowk heritage walk begins at the central point of the city, Red Fort. You then embark on a religious immersion walk for about 300 meters where you will cross the religious institutions of Jains, Hindus, Sikhs, Muslims, and Christians all adjacent to each other representing India's religious harmony. you will move on to the famous Paranthewaali Galli and NatrajDahiBhallewala to try out their fried paranthas, aloo tikki, and dahibhalle. You will then explore 2 prominent old-school Havelis in the region, one a poet's refuge and the other the largest Haveli of Old Delhi. Meandering through the lanes you will finally reach the Jama Masjid, India's largest mosque, and you will climb up to one of the minarets to get a bird's eye view of Old Delhi on this Old Delhi Heritage Walk. The tour culminates with some much needed Pet Pooja (A ceremony for the stomach!) as you devour renowned Mughlai cuisine. Thank you for your time and patience on this SeekSherpa Old Delhi Heritage Walk! The tour is suited for people of all age groups and fields. Its a treat for photographers, history lovers, foodies and the renegades who wish to do Chandni Chowk unconventionally. - People in sleeveless clothes and shorts are not allowed inside Jama Masjid. The Masjid also doesnt allow women inside after sunset. The Minaret at the Masjid closes sometime before the sunset. Equally good food for vegetarians and non vegetarians at the Matia Mahal street. Galibki Haveli is only open till 6 PM. - The travelers are advised to carry approximately INR 600 for the tour if they plan on trying all the delicacies. If a traveler wants to carry a professional camera/mobile phone camera inside Jama Masjid, then its a INR 300 charge that the authorities levy. He is pursuing my bachelors in English Literature from Hindu College, University of Delhi. Being an army man's son, he has lived in more than 8 cities and brought the myriad cultural knowledge to the fore during his Old Delhi walks. Nothing is better than travelling with a history lover and foodie who does it the untold way. In Chandni Chowk, many call it the cultural heart of India, there is a cultural location every few yards. One passes through religious sites, historical monuments, and the largest wholesale market in India and food joints that serve up delicacies such as dahibhallas, parathas, lassi, jalebis and awesome Mughlai food! The Chandni Chowk heritage walk which begins at the central point of the city, Red Fort, is an amazing experience and a treat for photographers, history lovers, foodies and bloggers! Explore 2 prominent old-school Havelis in the region, one a poet's refuge and the other the largest Haveli of Old Delhi. Meandering through the lanes we finally reach the Jama Masjid, India's largest mosque and climb up to one of the minarets to get a bird's eye view of Old Delhi. Experience a sound and light show like no other at the UNESCO World-Heritage-listed Red Fort and bear witness to the history of Delhi’s Mughal Empire. Some 300 years of history is showcased using special effects and colorful animation. Music and storytelling combine with this visual wonder creating an unique experience. People in sleeveless clothes and shorts are not allowed inside Jama Masjid. The Masjid also doesnt allow women inside after sunset. The Minaret at the Masjid closes sometime before the sunset. In the evening I had planned to celebrate Diwali by visiting a local temple. Upon my arrival I saw the temple has been decorated with colorful lights and flowers, given as offerings for the deities by the locals who had offered their prayers at the temple today. Inside, the evening ‘Aarti’ was being performed by the temple priest. Later I found a lovely restaurant where sitting outside I could see the sky lighting up as the Nation came together to celebrate Diwali, the Festival of Light! On my way back all the buildings, homes, shops dazzlingly lit up with multi-colored fairy lights! Thanks for a information. This information such as a really wonderfull. In this information atteched many beautifiul wedding pictures. This information relatied by wedding tulips photographers. We are more enjoy that industries work. Safety is more preferred in all industries limited company. The safety dept is more procure the work in environment. For example in reach height work maintenance. Direct contract for Boom Lift Rental and maintain the work. In that industry loved very much and more interest and important about safety Dept. What a article.Marvellous post by the author.I just wanted to add a comment to mention thanks for your post. This post is really interesting and quite helpful for us. Keep sharing. Hello Shanu, I like your blog very much and have bookmarked it, there are some places which i never visited yet, thanks for sharing the details. Get tailoring services for ladies at doorstep, designer boutique for women is now just a call away at 82-87-900-800. What an Incredible post, Indeed Outstanding !! Here's a great deal of information.Hotel Sunshine is near to railway station. We arebest budget hotels in haridwar.Hotel sunshine is located at the Moti Bajar, Haridwar. This is perfect month to plan a trip. Great Post! Our Bus Rental Company in Delhi offer great bus on rent facility for corporate events, weddings, & picnics trip in all over India.